Season one of Edo Ball included some of the most iconic players including Michael Jordan as a ghost, The Splash Brothers bursting from a wave, Lebron James flying across the sky as a Shogun and Kobe Bryant as the Black Mamba. The basketball art is inspired by the game for the ultimate hoop fan. 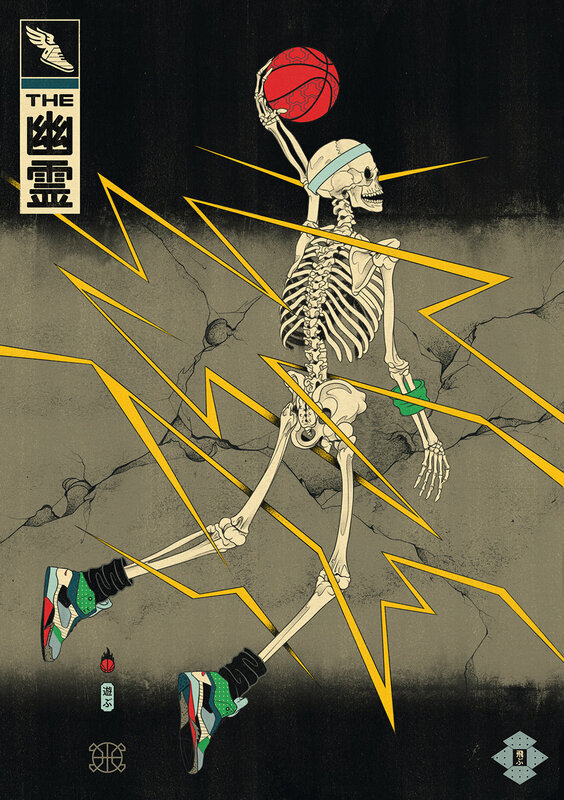 Edo Ball is a series of artworks created by Andrew Archer and is inspired by Basketball, Japan, NBA and Culture. Steph Curry & Klay Thompson are The Splash Brothers, the starting PG & SG duo of the Golden State Warriors. The Splash Brothers nickname refers to the duo's ability to "splash" the net with the ball, particularly on three-point shots. Arguably two of the greatest shooters of all-time, The Splash Brothers can make it rain from anywhere on the court. The shooting range, quickness of release and fundamentally sound shooting form makes them a tough cover for anyone. The second of the two original artworks which inspired the series. Yūrei is a faint spirit or also a ghost in the Japanese culture and religion. There are many different types of Yūrei, and they differ in many ways depending on the circumstances on their death. The one and only Object of Desire, the basketball. The sleepless nights after a bad game, the summer afternoons with the squad at the park. Fans of the game are born with the desire to play, to compete and to be involved in the culture of the game. The Shōgun held absolute power throughout Japan for hundreds of years, with dominance comparable to that of a King. Even though the Shogunate within Japan ended in 1868, a new Shogunate begun in the NBA in 2003 lead by Lebron James, who is still in power to this current day. Shōgun James has continually been the most powerful force within the association, dominating his 14 year career, proving year after year that there is still no general in the league who can take his place on the throne. On the 23rd of August 1978, Kobe Bryant, a.k.a The Black Mamba was born. Kobe spent 20 seasons in the NBA showcasing his iconic playstyle which was much like the snake itself. A relentless attacker with fantastic coordination and fundamentals, Kobe had the ability to break down any defender 1 on 1 and took over games with the best of them. Shinigami is the death reaper in the Japanese culture and religion and is responsible for inviting people to the underworld. Sporting a long wingspan and extremely large hands makes The Klaw a nuisance on the defensive end of the court. Kawhi is also the leader of the Cornrow Club, being one of the last NBA players to rock cornrows. But there is also another sniper in the game, the one responsible for flopping. A flop is an intentional fall by a player after little or no physical contact by an opposing player in order to draw a personal foul. Beautiful basketball art presented as museum quality prints on archival paper. All prints are available in the Store in the Japanese 'Oban' format and are printed on A3 (11.7" x 16.5") and A2 (16.5" x 23.4") 300gsm acid free paper with archival pigment inks. The full collection of artworks are available individually and as sets of 2 or 3.